« Authorised Service Centre for CARR Amplifiers. Do we cater for the jazz guitarist ? Yes ! It’s not just about rock’n’roll, we offer our repair services and custom-design/custom build services to every type of musician who is reliant on some form of amplification/sound-reinforcement. This would include jazz, jazz/rock/fusion, country, alt-country, folk-rock, pop, blues, soul, rhythm & blues, roots music/world music………………..the list goes on and on. Actually, the Richards family has always been into jazz, swing, big bands, hawaiian steel guitar, etc, all the way back to the 1930’s. I am the black-sheep of the family, I am the one who was seduced by the music of the British Invasion bands from the mid-1960’s onwards. I just couldn’t get enough of The Beatles, The Yardbirds, The Animals, Cream, Hendrix, The Who, The Small Faces, Led Zep, Jeff Beck Group, Jethro Tull and many more, and I’m still hooked ! However, getting back to the jazz musicians out there – we pretty much have the cream of the Australian contemporary country music scene resident here on the NSW Central Coast, but we also have a few jazz orientated players here as well. What kind of equipment issues do they have ? Getting a warm, satisfying tone is a prerequisite as is having enough headroom to voice those complex chords with clarity and authority. Getting a balanced tone and levels across the 6-strings and in fact the entire guitar spectrum is another major issue, particularly if you are playing a hollow-body instrument, eg an arch-top. Most jazz guys would probably favour a guitar amplifier that is light and compact. A valve amp of something in the order of 20 watts with a single 10-inch or 12-inch speaker would seem a logical choice. For whatever reason that I don’t yet understand, there is a trend among jazz guitarists towards the Rivera amps from California, USA. Perhaps an influential player chose one of these amps and then others followed his example. A customer recently brought a Rivera Clubster 20 watt 1×10 combo to the workshop. The amp had certainly been reliable and is commendably light and compact. However, the tone was very thin and also lacking in headroom. The overdrive channel was really too high gain to be useable, and did not lend itself to modification, so I concentrated on the improving the clean channel in whatever way I could. I substituted another brand of output valves which gave slightly later break-up, ie more headroom. However, the biggest limitation of this amp is the speaker unit itself. If you are going to have a 1×10 combo, then that 10-inch speaker needs to be a good one ! The stock speaker does not have a good, balanced tone across the guitar spectrum, in fact it is rather thin and generally lacking in tone and dynamics. The biggest possible improvement to this amp was always going to be upgrading the speaker. I have had some experience with the Jensen NEO speakers, which unlike some of the various Jensen alnico and ceramic magnet reissues, have a very full balanced tone, without particularly favouring any frequency over another, and also good sensitivity. In other words, both the 10-inch and 12-inch Jensen NEO models are well suited to low powered amps, even though they are rated for 100 watts. After installing the NEO-10, both the customer and I agreed the tone of the amp was greatly improved as also was the sensitivity and headroom. I would like to also remind jazz players that I custom design and build valve amps for guitarists of all persuasions. Not as light and compact as the amp described above, I must admit, but designed and built to last the distance and achieve the desired tonality and performance levels. Possible design criteria might include the use of 6V6 power output valves for their very sweet tones, optional valve-driven reverb, and baxandall e.q. for a more balanced frequency response. 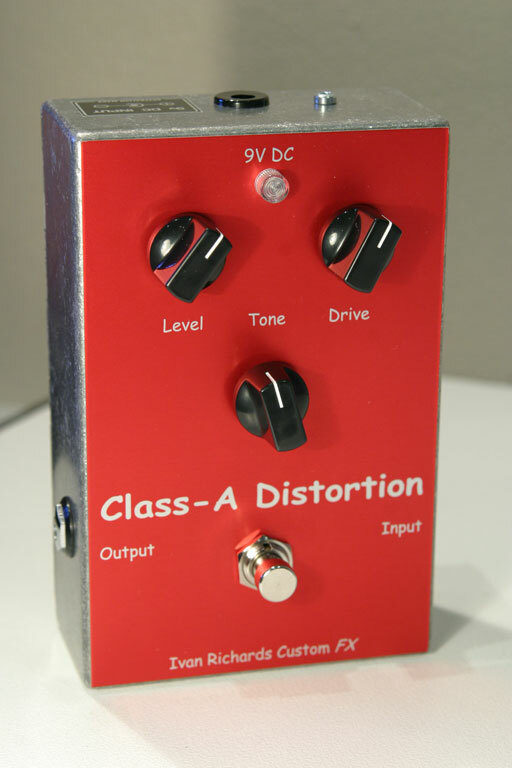 For distortion tones that complement those jazz/fusion explorations, you won’t find a better overdriver than our Class-A Distortion pedal, which achieves a very natural, very organic quality of distortion, with fine control over both level and tone. It never sounds harsh ! In fact, one of the first guitarists to purchase this pedal was Carl Dewhurst, a player and teacher well known on the Sydney jazz scene. Please take the time to check out our website: www.ivanrichards.com and please feel free to contact us if you have any suggestions and/or useful comments about any issues in the preceding paragraphs. Your own experiences in the world of jazz guitar amplification may well assist other players. This entry was posted on June 19, 2011 at 8:54 am and is filed under Amp Repair, Amps, Discussion. You can follow any responses to this entry through the RSS 2.0 feed. You can leave a response, or trackback from your own site.